Welcome back to the eCommerce marketing podcast everyone. I am your host Arlen Robinson and today we have a very special guest, Jeff Cohen who has over 15 years of e-commerce experience. 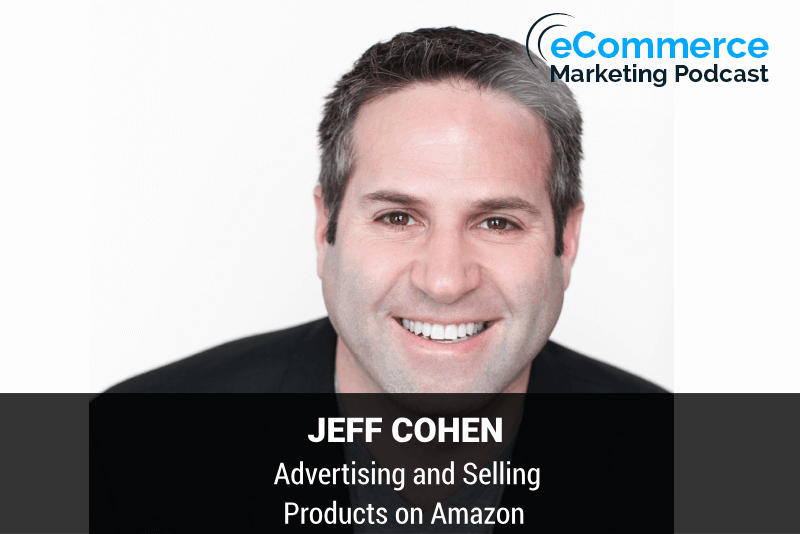 Currently, Jeff is CMO and partner at Seller Labs where he works with more than 50,000 Amazon sellers providing software solutions and expert advice as an international speaker. Jeff is regarded as an industry expert who is constantly asked to share actionable Intelligence on how Amazon. And how sellers can improve their business welcome to the podcast Jeff. Thank you. Appreciate you having me. Yeah, not a problem. Yeah, you've got quite a bit of experience there. And I know of course you are an expert in selling on Amazon. So why don't you tell me a little bit about how you got started a little bit about your background so you can Enlighten our listeners on where you are today and how you got there. Sure. Let's go. Let's go throwback style. Right? I uh, I was developing. Web pages back in the early mid 2000s and I was working for a division of Barnes & Noble in the textbook space. Okay, they came up to me one day and they're like, hey, we have this project. We want to develop a retail website. We have this really cool domain. It's called textbooks. You want to run the project. Wow, and I was like, yeah, that sounds cool. So in 2006, I started putting the business plan together and built the team to Launch. Which kind of moved me from a general marketing career in Communications to an e-commerce career? And when you develop a website like textbooks you become an e-commerce expert overnight. So as soon as the website launched and I was the general manager of the site. I was all of a sudden, you know, a rockstar eCommerce person, which was kind of funny because I really didn't know much about e-commerce besides the fact that I hired a really good team. Okay, and I did a good job of managing them turned that into a multi-year career running a price comparison site. So kind of on the affiliate side of the business. I ran one of the largest textbook price comparison websites, right and in doing that I connected with the co-founder of seller. Bob's originally hired him to be my programmer and then about ten years after that. He hired me to come and run marketing and sales for cellular Labs. Okay. Wow, so we kind of got our start in the physical product business buying products from USPS auction. So this kind of a funny story, but all the product all the stuff that is mailed to you and never shows up falls off the truck. Yeah. Ends up in a warehouse in Atlanta Georgia and back in the early 2010's they used to do physical auctions for that product. So you'd go into the warehouse. It was almost weekly these auctions and you'd go in and you'd look at the product. It was a kind of like storage locker Wars right? Same concept you could look but you can't touch and then you decide how much you want to spend on it. Yeah, and you buy the product and then you got to ship it back to your Warehouse start kind of tearing it apart. Lot of the products we would sell on Amazon a lot of the products. We would sell on eBay we built that business up to a multi-million dollar sales business. Okay, ranting running a 15,000 square foot warehouse and realized that we really like developing software more than we like to physical products. Okay, so we kind of closed the physical products. Side of the business and started pivoting to being a software business. So in 2013, we launched our first software for those in the Amazon space they would they're probably familiar with it. It's called feedback genius. It helps you solicit feedback sand reviews for your seller account. And then we followed that up with a tool for listing optimization called scope and then our most recent tool is an advertising management platform tool called ignite. Okay today, we work. At 50,000 Amazon sellers where one of Amazon's largest third-party software developers and you know, I get to speak a lot in the space about Amazon selling on Amazon Ecommerce. It's you know, really fun. Yeah. That's that's sounds awesome. Yeah and kind of get back to where you got started. Yeah, that's interesting. I never really knew that and I never really thought about it that all those items they get lost in the mail. They got to go somewhere. So how does the US Postal Service handle that now I've committed a physical auction. Or is it just is it online? How's that work? Yeah, they've moved that all online, which makes it a lot more. We what used to be fun. Now it's online. So everybody can setup tools to bid and have people in their office work on it. But one of our best purchases that we ever made was Brandon the my co-founder. He would stay at the auction for the whole auction. Okay, he always kind of was looking, you know, we would buy the books at the beginning and then he would kind of stick around and he'd buy like, you know, a container of Legos container of jewellery. He would just kind of by other stuff to just have fun. Right right. So one day he had stuck around and they came back at the end of the auction and they were auctioning off a truck a semi full of textbooks and something happened. So the person who had bought it like his payment didn't go through or something like that. Essentially we were able to buy what normally would have sold for like maybe 90 to 100 thousand dollars. We bought for like 35 40 thousand dollars. Wow, okay. So if you stuck around you got some really good deals. You could buy, you know, we bought jewellery once and had to kind of dig in and find out whether it was real gold or whether it was fake and you got you kind of got good at figuring out by I what was in these boxes and what the value was? Okay. Yeah, that's that's very interesting and ever really knew that we had ever thought about how they handled that. But yeah, it's interesting how you got started in that in that particular aspect of selling and buying now. I know of course. You got a lot of experience with Amazon. It's kind of what you're doing right now. And a lot of our listeners that are out there listening are probably in a mix of spaces, whether they're selling directly on their site of our e-commerce Solution on their site and but they probably are even or have even thought about dabbling in Amazon, but for those that really. Are just trying to think about is it worth getting their feet wet and selling on Amazon. Like where do they even begin? How does somebody begin selling on Amazon? What is that process like? Yeah. So, you know like everything in this world selling on Amazon is harder today than it was before right. I had to walk uphill both ways to do it when I was your age. There's ways to do it. There's there's ways to kind of dabble in it and what I always tell sellers when they're trying to get started as you just have to go do. Thing you just have to get in and start trying and figuring it out. So when I was getting started, I wasn't sure there's so many different ways to sell on Amazon, right so you can sell what's called Retail Arbitrage where you go to a physical store and you buy the product and then you sell it on Amazon. There's online Arbitrage where you're doing the same thing, but you're shopping from stores online. There's Jose where you're developing relationships with different host sale companies. There's private label branding which is where your. Bringing products in from overseas. So obviously each one of those requires a different amount of effort and upfront cash to get into it, right there's tons of resources online. I was having a conversation with somebody in the industry about courses and I don't think there's anything wrong with courses. I don't sell a course. Okay, but most all of the information that you would need. Is all online you can see it on YouTube. If you need a little bit more of like a step-by-step how to do something that of course is a great way for you to get that kind of step-by-step how to do it. There's a lot of tricks and stuff to it, right? There's a lot of stuff you can't buy today you that you could buy before so there's brands that you just can't you can't buy. So if you just think oh, I'm gonna go 200 sale at Toys R Us. I'm going to go buy a bunch of toys Toys R Us is going out of business. I'm gonna put those. Sale on Amazon and I'm going to make a bunch of money, right? You just might run into a few roadblocks that you just weren't considering and that's why I tell people just to go figure it out because most people that are successful on Amazon started out with something really small and really simple right there were two or three years ago. There were a lot of stories about people who started their business on $100. Right? Right, they went to the store and they bought a hundred dollars worth of products. Put it on Amazon and sold it the best way to start selling bar none. Download the Amazon seller app and start walking around your house and find things in your house that are in the box that you've never opened. Okay list them for sale on Amazon or put them on eBay. Right? Right. Just start putting something up to start getting used to understanding with how the system works what the fees are really like how the payment process works. You know and and stuff like that and then you'll start to kind of pick up little things along the way where you can iterate your process to make it more successful as you want to grow. All right. Yeah that makes total sense and I usually stick to that rule of thumb with most things when I talk to our customers that are looking at various types of. Online marketing and you know are trying to get into different things. I always say, you know start small before you do anything whether it's your advertising on Facebook. You're trying to experiment with Google Adwords. Yeah, you don't have to put the whole Farm out there to get started and it doesn't really make sense. And I think what you said is very key that you know, you can just get some items on your houses. You've never opened just so you see what the process is. Like, what is it going to take and then just kind of scale it up from there. See what you. See what you have to do. If you want to put you know a certain amount of inventory on there. What are you going to make on it? And yet that really makes total sense. Yeah. I mean so many people want to dive in they want to pay a couple thousand dollars from of course. They want to start putting a bunch of money into inventory. I'm not saying that that doesn't work. I'm just saying that. The first product that I sourced from China I lost money on. Um, it was a major learning experience for me. I had plenty of good guidance along the way but I still messed things up the first product that I brought in from China it ended up being one inch too long. So I ended up hitting the warehouse and it ended up being an oversized package. Well when you're an over sized package with Amazon, you have different inventory restrictions. Okay. So all of a sudden I had all of this inventory sitting. The dock and I couldn't ship it all into Amazon like I was planning on doing so I had to ship all the to a warehouse have the warehouse then reship it into Amazon because of my my inventory restrictions. I got charged different level of fees and what I had originally planned if I had put the product in the package diagonally, it would have cut an inch off the length of the box. It would have saved me over a dollar and half per unit. Oh wow, and so all of a sudden a lot of my profit God. Up by a small little mistake. Yeah, you have to go into it realizing that you're gonna make those mistakes and that you know, it's the future that is where you're going to learn from that to make more money on the next thing that you do. Yeah, that makes sense. Anybody you would never have known that, you know until you got it in you kind of dived in and you know, Sold the product and got to getting it shipped and fulfilling all of that. And so right those are exactly lessons learn that just come was just getting getting out there. Now, you know once a business has like you said gone through the steps Maybe started with something small and then kind of know what it takes to get it out there. And decide to put a portion of their inventory out there and you know start selling like what do they do? What are the next steps to optimize the marketing and advertising for the products that they have on Amazon because I you know, just from looking at the outside in it does seem like it could be a little intimidating to because you know, you're competing against not only Amazon but all of these other sellers, you're not really competing against Amazon. I mean, you know, this is where you have to break it down. Are you selling somebody else's product and you're fighting for what is called the buy box? Okay, right. So that's when you click buy now or do you have your own product and you're fighting for optimization on Amazon's search, right? So so there's two different paths within that. If you're selling somebody else's product and you're competing for the buy box, you don't really have marketing that you have to do per se because marketing only works if you own the buy box, right? So what you have to do is you have to really optimize your account because your account metrics ultimately determine whether Amazon's going to sell your product or somebody else's Amazon's goal. And this is what everybody has to remember Amazon's goal is to match a buyer with the desired product that they. Giving them the best experience possible. Right and everybody always wants to know like how do you make Amazon simple? That's it. That is the simple formula that has made Amazon one of the largest companies in our history. Right? Right. They have found a way to match buyers desires with suppliers products. And so if you own your own product at all becomes kind of a feedback loop, that's the way I like to describe it. Okay, and so you have to start with optimizing your product for search. That's your title and your bullet points. Then you have to start optimizing for conversion. That's your photos and your enhanced brand content your description on your page. Okay, then you have to optimize for traffic. Which is using sponsored product ads or headline search ads. Those are tools that Amazon has they also have coupons and other kind of internal tools. You also have to consider within traffic the idea of driving external traffic. We could do a whole podcast just on that. Okay, but you own your own website, you have your own traffic. Why would you ever want to send it to Amazon? Right a question? A lot of people ask right. Well the reason why is because Amazon is. Fifth largest media Outlet in the country, the amount of traffic that Amazon has is gigantic. If you could use a little bit of your traffic to help generate sales of your product on Amazon. They're going to give you and reward you by giving you more of their traffic. I see I see so so when you talk about traffic you have to talk about advertising, but you also have to talk about driving it in from external resources. And then finally you got too close. Loop with feedback, you got to get reviews on your product and you have to use those reviews to help you build a better product for the future action. You know, I'm glad you mentioned the advice about the traffic and I never really realized that's kind of how it works because I know a lot of e-commerce businesses are like, all right. Why do I want to what I wanted to? Any of my traffic through Amazon, but I mean it makes perfect sense like you said and that's I guess part of their whole algorithm with if you're getting more traffic in searches for that particular product that you have then, you know, they're going to reward you with, you know, getting more views and things like that. And so Amazon's algorithm is really based off of sales velocity my product that is selling more indicates that Amazon that that is. Something that people desire and remember we said at the beginning Amazon's goal is to match a buyers Desire with a product that meets that need gotcha. Gotcha. And then their whole goal is to get it to that person as seamlessly as possible and exactly exactly their whole process. Yeah, that really makes sense and speaking of actually getting it to the product to the customer seamlessly as possible and they do a great job of doing it. I mean really are there any disadvantages in selecting to have Amazon fulfill your orders versus you fulfilling your orders? Well, you know back in the day when I was running textbooks. I was part of a company that was a 300,000 square foot Warehouse delivering books all over the country. And what amazed us about Amazon back then in 2005 2006 was how cheap they were able to process and deliver. Packages, right and they've only gotten better at that over the last ten plus years and you know, if your product if you're selling a product you want what's called Amazon Prime, right? You want the prime badge right and the way to get the and the way to get that Prime badge is to have your inventory in FBA, which is fulfillment by Amazon. There are ways to get the prime. Without having your product in Amazon, but most people especially when they're getting started or going to use Amazon as their fulfillment Channel. Okay. I was having a conversation with a friend of mine who owns a backpack company and he said to me well, you know, why don't I just list my products on Amazon but not ship them into the warehouse and I said when it comes down to it Amazon Prime Shoppers, and there's been unsubstantiated rumors that 55 percent of households across the. States have Amazon Prime Amazon Prime Shoppers are higher income individuals. They they are more loyal to the Amazon site. They only shop for the prime badge. They look for it. Even if they're buying a more expensive product that has free shipping. They want Prime they want to day delivery. Yeah. So what are the disadvantages the disadvantages are more? What are the disadvantages of not having your inventory in there? Is that you begin to alienate a large number of the Shoppers who are only looking for that designation? Sure. That's really what I thought because I might know just for my own personal experience anytime. I'm purchasing from Amazon. That's all I look for if it's a specific item. When I do a search, I will select Prime only and even if before I've done that and I've seen that a product is fulfilled not by Amazon. I I may pass on that. I may just say. If it's the only thing maybe if it's the only option you have I'll give you two examples here one. I was buying something for my son the other day Okay, and the product was no longer available with free Prime shipping, right? That product went from being and it's a heavy liquid product. Right? Okay that prop that product went from being something that I bought on repeat order from Amazon to something. I went to the store to buy. Okay, because it just the cost. The product to pay for shipping just got too expensive and I didn't want to pay for it. Right the second example that I like to say is that Amazon has changed the way we as consumers shop, right? So so I like to say there used to be these really big things called shopping malls, right? Remember those. Oh, yeah, in our teenage years we would get dropped off at those malls and we would cause a bunch of trouble until our parents would pick us up every basically. That's about all they're good for today. Yeah, because. You know, I I went and purchased a product online from Target and five days later. I got an acknowledgement from Target that my product shipped. Oh wow five days after that my product arrived. Ten days in that period of time I made three or four additional orders from Amazon and had them delivered. I forgot I ordered the product. My wife said to me she goes where are the sheets? I was ordering sheets for my kid for summer camp. She goes, where are the sheets I go. I swear I ordered them. They're supposed to be here. I swear I wrote a whole article on LinkedIn about it because I it was interesting because I was like, I wanted to kind of Chronicle about how we as. MERS have have a totally different mentality to how internet shopping is supposed to occur because we now have this immediacy that I'm gonna order it. And today is Friday. Right right recording this on a Friday. It will be delivered to me on Sunday. Yeah, exactly. That's crazy. They basically have spoiled all consumers. Right? So like if you have your own if you have your own e-commerce site and you're gonna. And in you get an order at five o'clock on Friday the odds are you won't even process that till Monday. Yeah, exactly in my products can be delivered on Sunday. I mean, do you remember the time where you couldn't even like, you know by by Liquor on Sunday, and now we getting packages delivered on Sunday? Yeah. Yeah. It's really unbelievable. They've changed the entire landscape and the way people. I think about ordering online and like like I said before it's they really spoiled everyone. So these other guys like like you said Target in your example with the bed sheets and the Walmart. I mean, I don't know unless they do some drastic. Well, they're starting to write like Target just bought a company called shipped Walmart is starting to do package pickup at the store right there. They're having to conform to The New Normal that Amazon has created. Yeah, yeah, exactly. So they're they're gonna make that they have to make the changes. I mean that's the only way that they'll they'll be able to survive for sure. But as far as speaking on different products, you mentioned, you know couple items let's say the bed sheets for instance. Um, it's you ordered from from. You know, there's a lot of businesses out there listening some variety of different products in a variety of different niches. What are there any certain products or types of products that do the typically do better on Amazon versus others than your experience. Yeah. So, you know Amazon used to be a bookstore right now. It's really everything store. And so it's hard to say there's definitely products that are going to sell higher volume because more people are looking for them. But all types of products do well on Amazon the key when you're. For a product that you want to sell on Amazon the key is what are you doing to make that product better? Right? That's the key so I can sell the same garlic press as the other 2500 people selling a garlic press on Amazon. But if I can do something to actually make that better, I can innovate the product. I can bundle it with other things. I can make a color that isn't currently being made. I have a much better chance of succeeding than just trying to put that product online. Yeah and have it compete because what's going to make me stand out what's going to make me differentiate and it's kind of been lost in the world right of Amazon and you know, one of the ones I like to show or I like to talk about is the pimple popper, right, you know about dr. Pimple. I would exert actually you'll have to look that up afterwards and then you'll be like that's disgusting but dr.
Pimple has become this like YouTube crazy. Amongst like Millennials of like videos of people pimping Popples. Okay, Papa popping pimples don't even don't even edit that. It's deserves it to be messed up dunk was there are four hundred and eight different versions of pimple popping products on Amazon. Wow. So are there people buying these products? Yeah, but if you go and you look at them, they all look alike. Nobody's done anything different. Yeah. So if you're gonna go get this product and bring it to Market, what are you gonna do to make your product different and if you can't answer that question, maybe these are all nine packs and you're going to offer a 24 pack, maybe all these are plastic and you're gonna do stainless steel maybe all these. Are you know, I'm just kind of making stuff up here, but you've got to come up with something that's going to move the product along and give people a reason to buy from you versus buy from everybody else because there's only so many people looking for this product on Amazon. I like to say you cannot generate Demand on Amazon. The demand on on Amazon is captive to the number of people searching for a product, right? So, what are you gonna do to make them? Want to buy from you versus buy from somebody else? Yeah, that really makes total sense. I mean like you said there's so many of the same products out there. I mean I could you know, I've had this case where I'm looking for something and you know, I'm like, all right. Why would I go for this seller over the other? It's the same product almost exact same description and it's like unless there's something added there that's going to make me say, okay. Well in this particular seller is offering a two pack and it actually comes out. Cheaper per product with the 2-pack, you know, I've had cases like that where it made it made sense for me to go ahead and get a 2-pack. Yeah host from buying it from another seller who I was gonna pay a little bit more buying it, um, you know a single pack so yeah. Yeah, here's a great. Here's a great. Here's a great example for your listeners. I have a friend who sells laser tag guns. Okay, and he actually talks about his story. So if you go to seller Labs, there's a link to. About his whole story. So I'm not sharing anything. He hasn't shared on his own what he did right? There are several hundred suppliers of laser tag guns on Amazon. Okay, what he did was a couple of things one. He took the laser tag guns and he took it and turned it into something different what he turned it into was he turned it into capture the flag and by turning it into Capture the Flag. He looked different. The other 664 people who are online selling the product. Okay. So now you look at yourself and you say well, I don't want to buy the regular laser tag set. I want to buy the capture the flag laser tag set, right? Hey, so so what are you doing to make your product different? What are you doing to innovate your product to be something else? And that's ultimately what you have to figure out because the competitive landscape is very tough. Yeah, and that's a great example because essentially it's the same laser in that example was the same laser tag gun. It's just where he packaged it. He had that interesting game into it exactly where even though it was really the same Hardware that the you're actually getting. Is just that that game that he kind of tagged along with if captured the flag made it seem a little bit more interesting. Like wow. Okay. I have got a laser tag gun, but it is a capture the flag set as well. Yeah, and a lot of a lot of times you're talkin about an add-on. It's gonna cost you Pennies on the dollar. Yeah, and it adds so much value to what you're selling. Yeah, for sure. Sure. So Jeff if you could give one final piece of advice. You know any Commerce business that's considering selling on Amazon. What really what would it be? I mean I go back to the symbol one. I'm say take action. Okay, you know you and I have been in this business for a long time and and we both talked to so many people who are interested in doing something who have an idea that they that's the next million-dollar idea that that had the idea before somebody had the idea. Right? Right, right the key to all of that is taking. And that's what makes the difference that's what makes one person successful and another person fail and if we can't take action and be okay with failure, then we're not going to succeed and we have an interesting motto at our company. So we have 42 employees. We've developed for different softwares. We work with 50,000 Amazon sellers and we tell our employees it's part of our our pillars of success. We tell our employees that you have to make decisions. Based on the data that you have you'll never have a hundred percent of the data to make a correct decision. So you need to use the data that you have at the time to make the best decision possible. And then adjust your decision based on the outcome that it that that comes from it and we really seek to empower our employees to make those decisions from our customer service reps to our product managers to our. Janeers, because we understand that we're going to make mistakes. We understand that we need to innovate over time. And so if we're constantly trying to be perfect in everything that we do we actually slow down our ability. To be productive with what we do and so that probably the two pieces of advice that I would give. Okay, great. That's that's really great. That's excellent piece of advice both pieces yet for for sure. I know our listeners will will appreciate it. Well Jeff, you know, definitely appreciate you joining us here on the podcast all of the information you provided I know is really invaluable because I know a lot of listeners. Are in the same boat and they've been considering Amazon and didn't know what it took and you've given some great actionable advice. So now if you know if anybody wants to get in touch with you, how do they do it? Yeah, I'd say there's two ways one is to follow me on LinkedIn. So Jeff Cohen, I'm the one who I think if you type in like Jeff Cohen Amazon, or I can get you the link and you can add it to your show notes. I I post on LinkedIn pretty regularly seller Labs also has a Blog. Blog it's a great way to just kind of follow our insights and Industry knowledge. We don't cover a lot around getting started. Right so that's not necessarily who we tailor our message to most of our customers have already gotten started. Okay, if you're looking for kind of the raw how to get started in the in the space. There's probably three people I would recommend. First is a guy. His name is Scott Volker. Scott runs a podcast called The Amazing seller. Okay, the second one is a guy named Jim Cochran. Jim runs a podcast called Jim's gonna kill me for not remembering. I'm sure if you just Google Jim Cochran podcast, you'll find it. Okay silent Jim silent. Jim is his podcast. Okay, and then the third one is a guy his name is Will Mitchell and he runs he doesn't have a podcast but he has a website called start. Bros okay, like yo, bro, what's up? Okay, you know a lot of times there's also a fourth one that a lot of people use called amazing. They've been around for a while and a lot of people say to me like well, why do you have you know, why do you offer four or five different ones? And the and the reason why really comes down to there are different people in different personalities than match with different host. Right? So if you really want to get into podcasting I would tell you to check out amazing freedom. Okay, right. So it's like what do you want to get into? And and and who do you connect with? Because they're all really good. I know all of them personally. They're not selling snake oil, right? They actually want their students to succeed and they give a ton of value and content for free. So those are those are probably the ones that I would recommend you kind of get started by listening to and like I said start listening to them and kind of see who. Kind of matches with your personality because you'll see that in listening to them. They all have very different personalities. Gotcha. Gotcha. Yeah, that's for sure. That's one of the things that I've recognized I listen to a lot of podcasts and it's you know, it's like always there to host that you resonate with and your little bit more receptive to so yeah. I really appreciate you giving all of those podcasts that our listeners can go ahead and check out. Okay, Jeff. Well, thanks a lot again for joining us today on the eCommerce marketing podcast. We appreciate your advice and your tips. Yeah. We wish everyone well selling on Amazon. Thank you. Thank you. Thank you for listening to the e-commerce marketing podcast to access the eCommerce videos and other resources to help your business. Grow. Please visit get forward slash videos subscribe to us on iTunes by searching for e-commerce marketing podcast, and please leave a rating and a review. Thanks for listening.